This month we would like to congratulate the Webster County Wranglers 4-H Club for being awarded the Nebraska 4-H Club of the Month for April 2017. This Club from Bladen, NE, in Webster County, has truly made a difference in its community. The club is dedicated to building strong citizenship and teamwork through various activities. The Webster County Wranglers club members are enrolled in a variety of projects, but the club specializes in the horse and dog projects. Club members participate in a variety of workshops that are available in their region, including the dog expo, horsemanship clinics, sewing clinic, and a barn quilt workshop. The Wranglers have organized and hosted an open horse show at the beginning of summer that enables local 4-H’ers to prepare for district and county shows. The “Webster County Classic” has been held in Bladen each year for over 25 years. The club picks up trash each year along a section of highway that leads to our fair grounds. Club members have a food stand during a regional judging clinic that is held on our fair grounds each summer. The club also holds fun and educational club meetings during the winter and spring months. 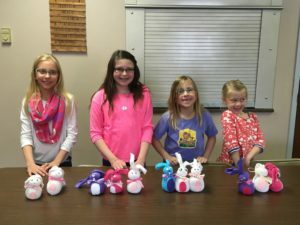 At those meetings, members have completed club projects that have included making sock bunnies, string art projects, and cooking and baking activities. Members learn about horses and dogs through member and club leader presentations. Weekly dog and horse practice sessions are held during the late spring and summer months at the fairgrounds. Members ride their horses and lead their dogs through the 4th of July parade in Blue Hill each summer. The club puts together a table that highlights project areas completed by members at the annual 4-H Jr. Leader Soup Supper. The Webster County Wranglers is a fun and energetic club that strives to serve its club, community, county, and world. The Nebraska 4-H Foundation provide the 4-H Club of the Month program to all Nebraska 4-H clubs throughout the state. Clubs can nominate themselves by telling why their club should be chosen as Club of the Month. A different club will be chosen each month and will be awarded with a certificate and $50 cash card. For more information go to the Nebraska 4-H Foundation website at http://www.ne4hfoundation.org/recognition or e-mail ne4hclubofthemonth@gmail.com. No Comments to "April 2017 Club of the Month"